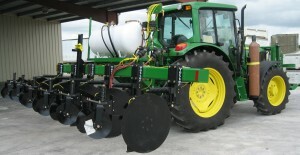 The machine shown is a 6 row low disturbance Telone applicator. 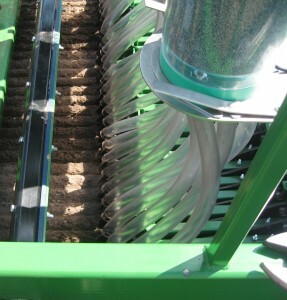 Primary usage would be to stale seed beds for cotton when it was not applied during bedding. The implement running on old beds requires a low horse power fuel efficient tractor making economical applications. The system has cover disc to re shape or compress beds as needed. The machine shown has a tank, nitrogen bottle rack, filters, valves and manifolds making it self contained. The unit is a PTO driven Hydraulic drive 3 bed mower. The row units are independent and follow the bed top and hold a vary close mowing height. The toolbar is the oil tank and cooler and allows for low oil tempertures. 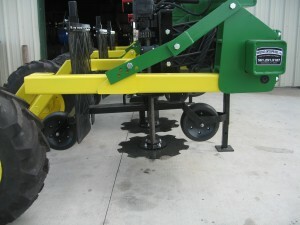 The unit shown has 2 gage wheels and 2 additional wheels covering all row middles. The wheels crush the old crop material speeding up decomposition. The machine is for planting spinach or mixed lettuce on raised beds. The unit is set up to plant 30 lines of product on a 54" bed top. Each seed unit is independent with it's own skid shoe for depth control. The system helps with germination because each seed is at the same depth offering a more uniform harvest.